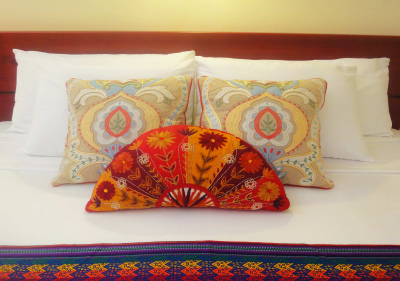 Welcome to the official reservation webpage of Mérida Santiago hotel boutique. We Guarantee that on our website you will have The Best Rate. As you book directly to the hotel we can give you a better rate as we do not need to pay commissions to other booking companies. You can Save time as Our booking engine has the best offers, so there is no need to shop around. You can Relax as When you book directly with us, there is nothing left to chance. If canceled or modified up to 14 days of arrival no fee will be charged. If canceled or modified later, or in case of no-show, the total price of the reservation will be charged. Elegant room with sitting area aside inside the room and aside the pool. Ground floor atmospheric room overlooking the pool with quality king size bed. The king suite features designer furnishings and unique details and decoration. 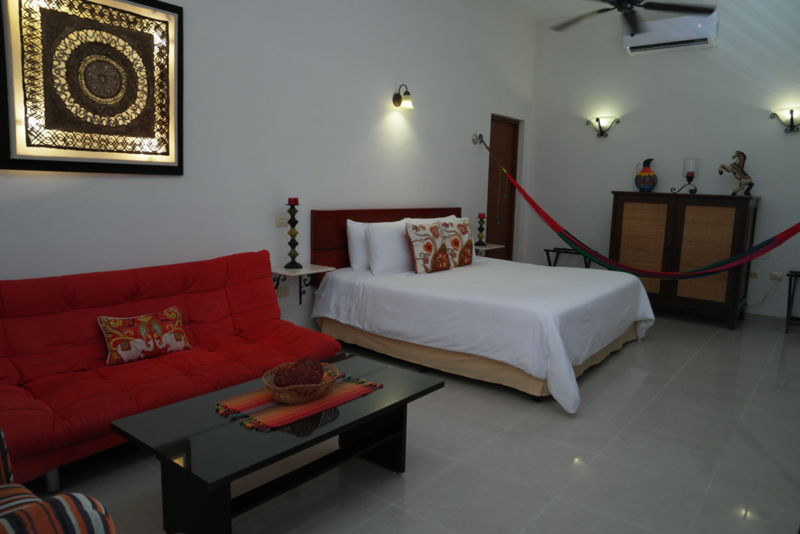 Abundant use of Yucatan materials, like the Crema Maya stone double sinks, the closet, the bed. Needless to say…there is high speed optical WiFi in the room, individual air conditioner, a ceiling fan and 32″ LED TV with satellite receiver. The king room offers a Nespresso Coffee Machine and there is purified cold water in the minibar available. There is a sitting area inside the room and a covered outside sitting area with 2 chairs and a table. The bathroom has plenty of space, and you will find a hairdryer, magnifying mirror, quality towels, organic amenities and a full dress up mirror. A coutesy home made gourmet breakfast a la carte is served from 7:30 am to 9:30 each morning. The finest 100% arabic coffee beans cultivated in Mexico are freshly grinded to provide you with the best coffee. The restaurant opens at noon and the bar is open all day. Some guests prefer the hammock in this room to take a rest. 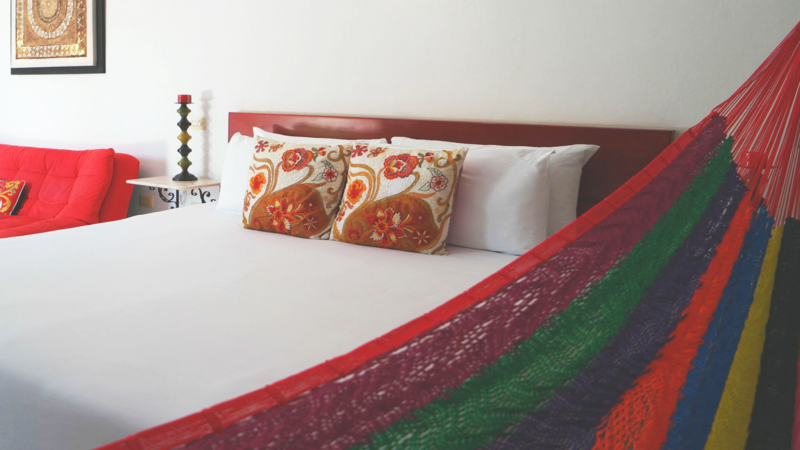 Others prefer one of the two quality queen size beds with side tables made of Yucatan stone, to have a comfortable sleep. 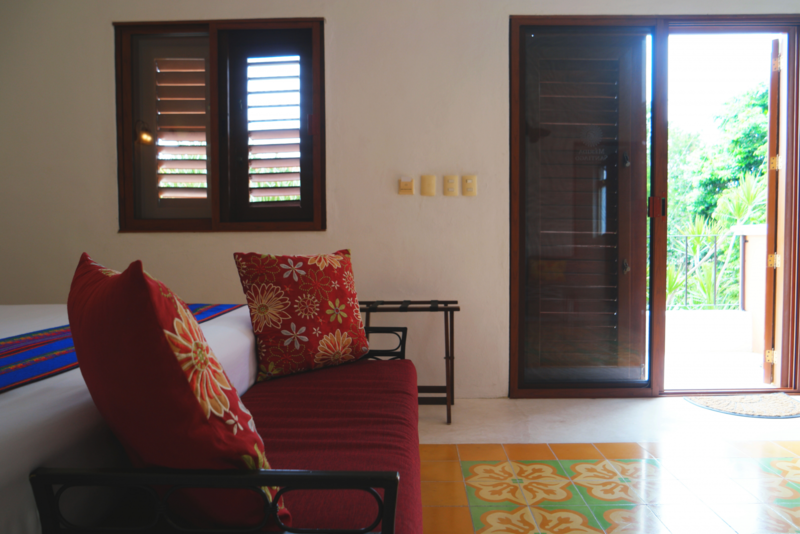 The room has convenient chairs and tables inside and also an outside sitting area with view on the courtyard with pool. 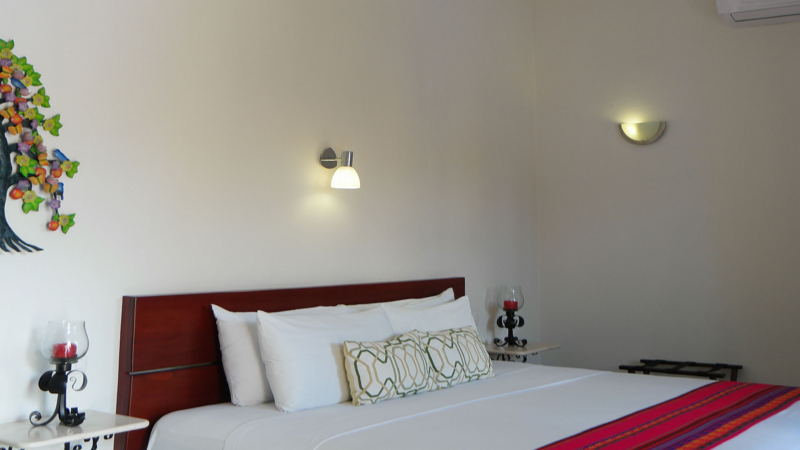 Each of our rooms is equiped with HD led TV with cable/satelite television with international channels, free optical WiFi, fan , premium linens and air conditioning. The light interior colors of the room blend well with the warm tones of the custom woodwork and creates a fresh atmosphere. The enchanting bathroom offers double sinks made from Macedonia stone a placed on a big top table. 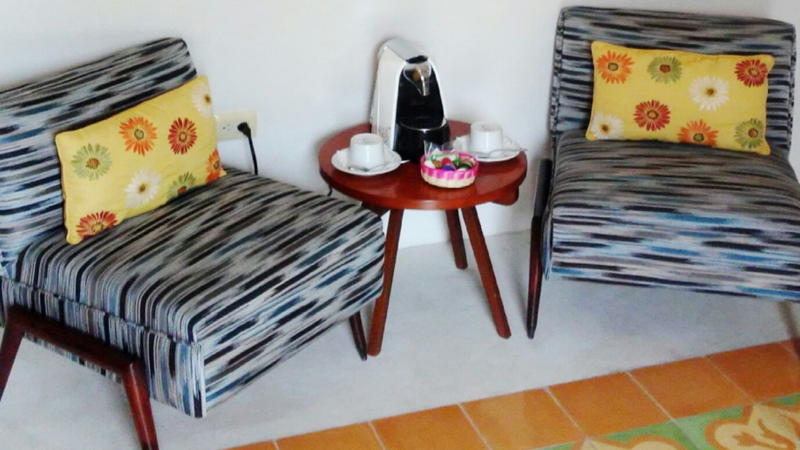 You will find a hairdryer, magnifying mirror, quality towels, organic amenities. A relaxing and refreshing experience is offered by the two person hydrojet Jacuzzi and the pressurized walk-in rain shower. A coutesy home made gourmet breakfast a la carte is served from 7:30 am to 9:30 each morning. The finest 100% arabic coffee beans cultivated in Mexico are freshly grinded to provide with the best coffee. The restaurant opens at midday and the bar serves all day drinks. The superior suite is located on the first floor. It has a king size bed with a quality mattress for comfortable sleeping. The room comes equipped with a HD LED television, free and fast optical WiFi with in-room reception, ceiling fan, premium linens and towels, a hair dryer and individual air conditioning. 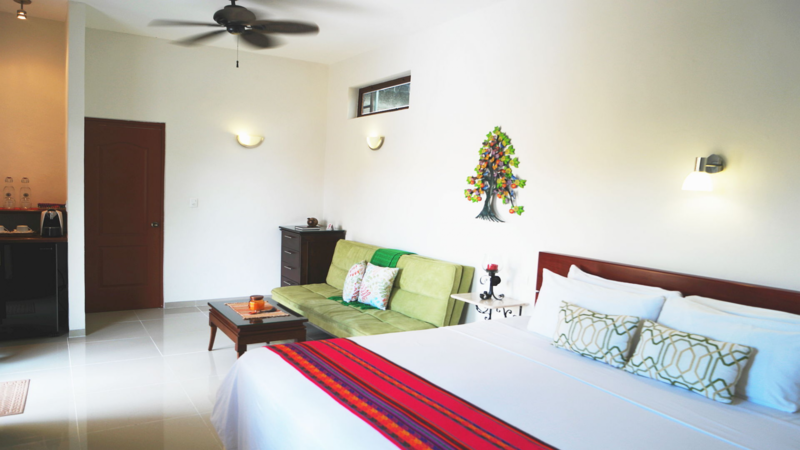 The en-suite bathroom is spacious and comes with dual sinks of Yucatecan Tikul stone and a large walk-in rain shower. The full size dress mirror assist those who like to dress up elegantly. 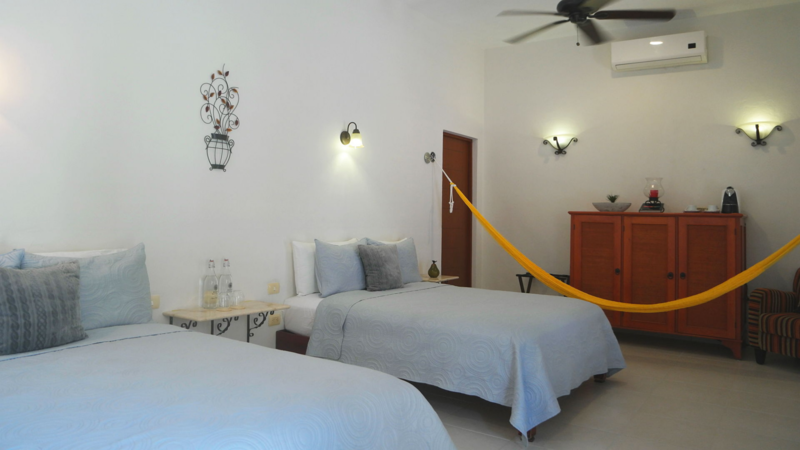 You will find a hairdryer, magnifying mirror, quality towels, organic amenities. This is a room for the spoiled traveler. 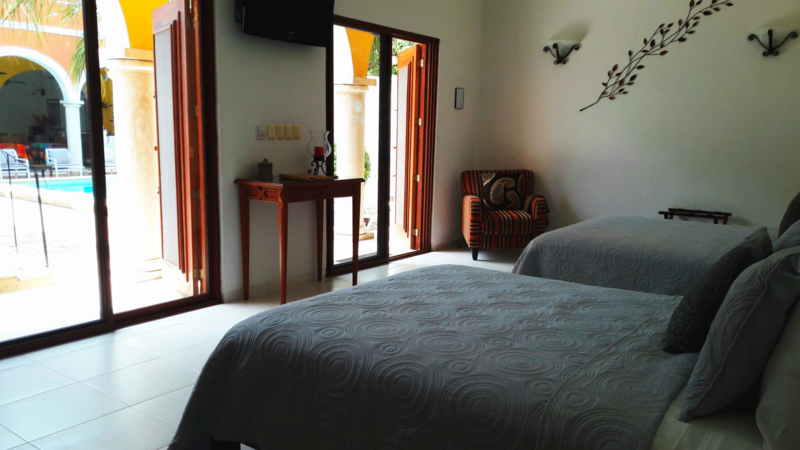 Quality king size bed, inside and outside sitting area with view on the courtyard and pool. 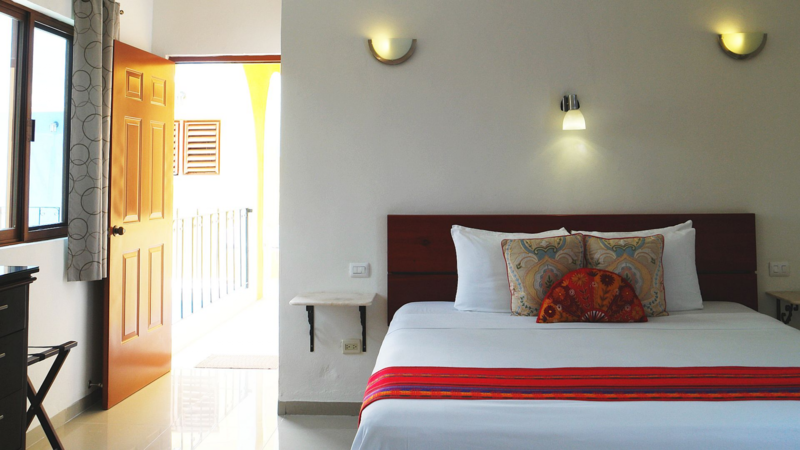 Each of our rooms is equiped with HD led TV with cable/satelite television with international channels, free optical WiFi, two ceiling fans, premium linens and air conditioning. 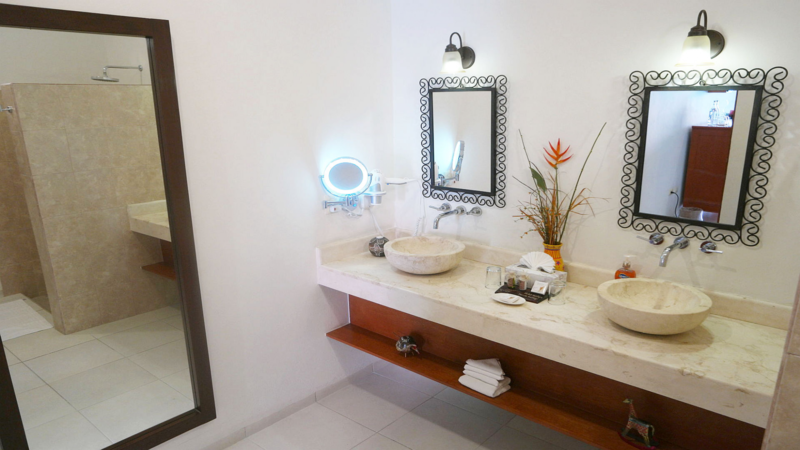 In the bathroom you find a hairdryer, a magnifying mirror, quality towels, organic amenities. A relaxing and refreshing experience is offered by the two person hydrojet Jacuzzi with chroma therapy and the pressurized walk-in rain shower.with view on a tropical Mamey three. This room is favourite to anyone who has something to celebrate or appreciate luxury..
Overlooking the courtyard pool this spacious suite is comfortable and relaxing. 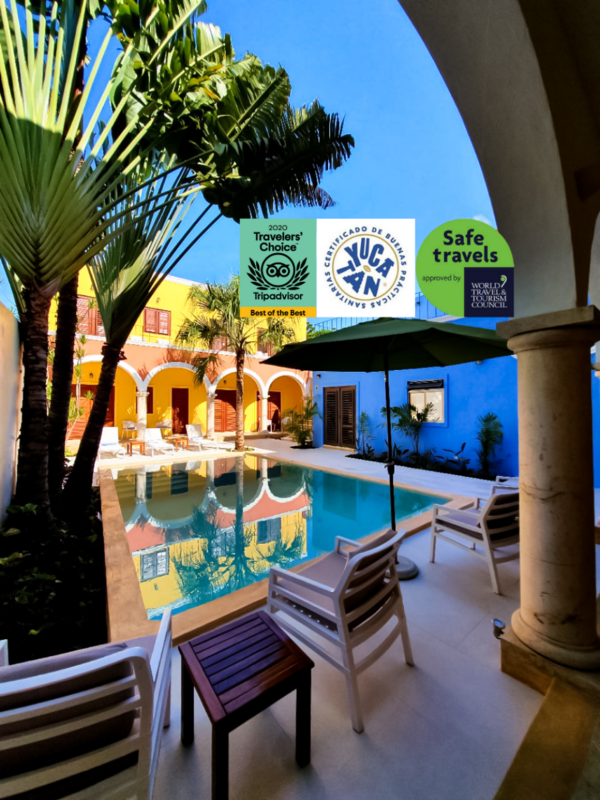 The seating area and the quality king size bed will help you to charge energy for the next exciting tour, activity or events which happen all days in Merida. Each of our rooms is equiped with HD led TV with cable/satelite television with international channels, free optical WiFi, fan, premium linens and air conditioning. The bathroom is spacious and offers two Crema Maya stone sinks, a hairdryer, magnifying mirror, quality towels, organic amenities and a full dress up mirror. A revitalizing shower can be taken using the walk-in shower with sky light.The outside chairs and table give a wonderful view on the courtyard. A coutesy home made gourmet breakfast a la carte is served from 7:30 am to 9:30 each morning. The finest 100% arabic coffee beans cultivated in Mexico are freshly grinded to provide you with the best coffee. The restaurant opens at noon and the bar is open all day. This room is located on the first floor. Its unique feature is a private terrace with hammock and outdoor furniture and terrace lights. The room has a quality king size bed and cozy sitting area. Each of our rooms is equiped with HD led TV with cable/satelite television with international channels, free high speed optical WiFi, fan, premium linens, air conditioning and Nespresso coffee machine. The bathroom is spacious and offers two Crema Maya stone sinks, a hairdryer, magnifying mirror, quality towels, organic amenities and a full dress up mirror. A revitalizing shower can be taken using the walk-in shower with sky light. All children above 11 years old are welcome. A valid Credit or Debit card is required at time of booking (Master Card - Visa - Amex). In case of smoking in the room, a penalty of $ 200 USD must be paid. Check-out 12:00 pm & Check-In from 3:00 pm. If possible early check-in will be till latest fligt arrives. You will be charged 10% of the total price if you cancel or modify after reservation and the total price if you cancel or modify within 2 weeks before arrival or in case of no-show. You will be charged a prepayment of 10% of the total price after reservation and the remaining amount in the 21 days before arrival.